Even though I still turn my heater on at night sometimes, there is no doubt that winter is almost over. This is evident as Yuye has already started his annual ritual of sneezing whenever he goes outside or mows the lawn. I am one of the lucky ones who doesn’t suffer from hay fever but all I can do for Yuye is tell him to take his meds. This is probably the only time I’m thankful that I’ve inherited most of dad’s genes! End of winter means less of the beautiful hearty winter foods and winter ingredients, so I’ve been trying to eat a bit more of what’s fresh and cheap at the market. I found a beautiful head of cauliflower a little while ago and had been wondering what to do with it. When I was going through the left over ingredients in the fridge and pantry, I suddenly realised that most of what I had could be put together into one dish! How convenient…maybe I had subconsciously planned this when I went shopping! I would have made white sauce using milk instead of cream, but it turned out that I forgot to drink the milk and it had gone off! I was so sad but thankfully I still had my trusty Costco cream handy. I didn’t want it to be too creamy so added a little bit of water to it. You don’t have to do this as it does make the sauce quite liquid, although still very delicious. I didn’t make the sauce as thick but if you like it thicker, feel fee to add a little more butter and flour. I think I’m getting quite old as well…I realised after I took the ingredients photo that I actually forgot to put the mushrooms into my bake! They were sitting there behind a big plastic bag and it totally slipped my mind. So, I’ve adjusted the recipe to make the mushrooms optional, it may or may not have made the dish taste better. 1. Pre-heat oven at 210C. 2. Fry bacon and onions in a flat pan until fragrant. 3. Melt butter in a medium to large saucepan over medium heat. 4. Add in flour. Stir and cook for about 2 minutes or until the butter and flour are incorporated but not browned. You might want to take the pan off the heat for a moment as you mix them together so they don’t burn. 5. Pour in warmed cream and water/stock (or milk) and stir until you get the right consistency. Slowly bring up to a simmer. 7. 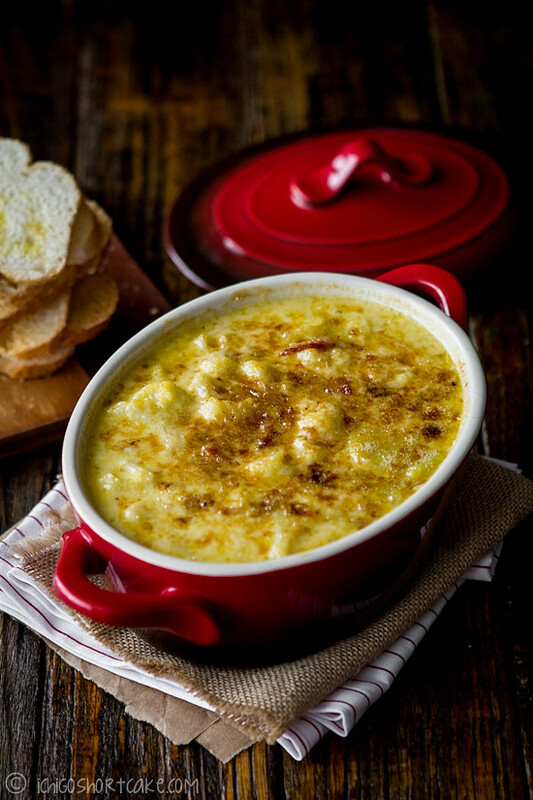 Scoop contents into an oven-proof bake tray and top with grated cheese. 8. Bake for roughly 10 minutes or until the top is golden brown. Serve with toasted bread. *Alternatively to save time, you can microwave the cauliflower and potatoes (submerged in water and then drained when cooked) for about 7-8 minutes beforehand, or eliminate this step altogether and just put them raw into the sauce in the oven. The oven time needs to be adjusted to make sure they cook through if taking this option. Question time: Are you burdened with hay fever and do you still enjoy going out in Spring? A fabulous combination! So scrumptious and comforting. I love that shot of the cauliflower. Ooh, nothing better than a creamy bake when the weather turns chilly. I just want to curl up with this. That looks creamy and delicious. Yum! 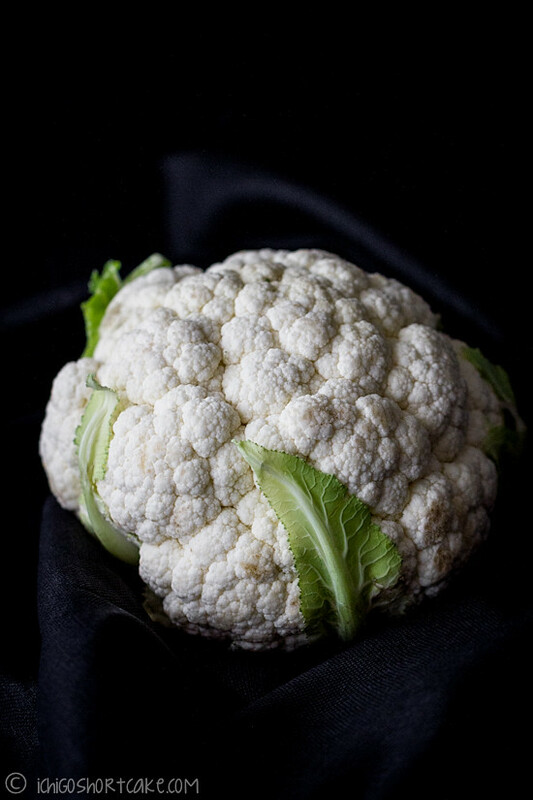 I love cauliflower, so I can just imagine how delicious this dish is. 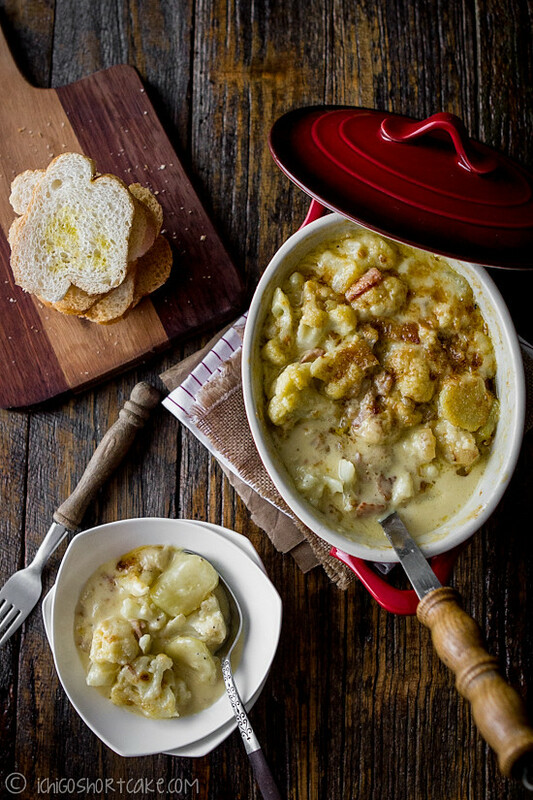 What a delicious gratin! I’ll definitely be giving this a try once summer is over! 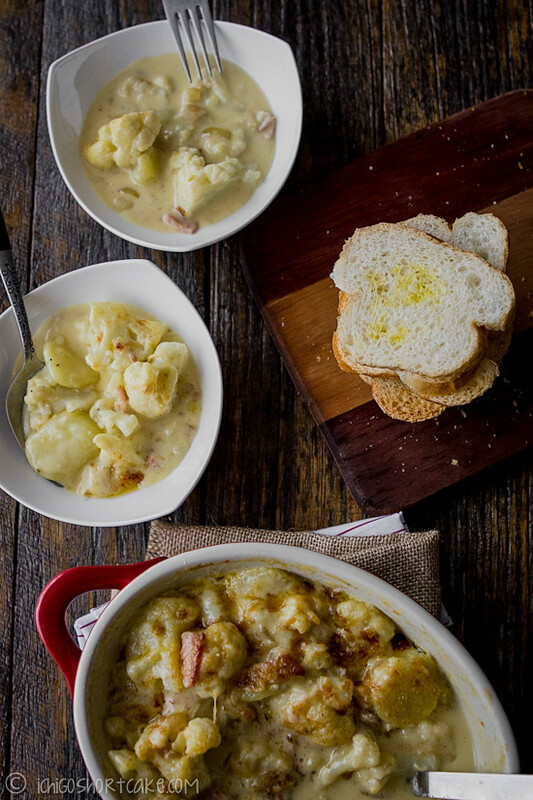 this looks like wonderful comfort food! 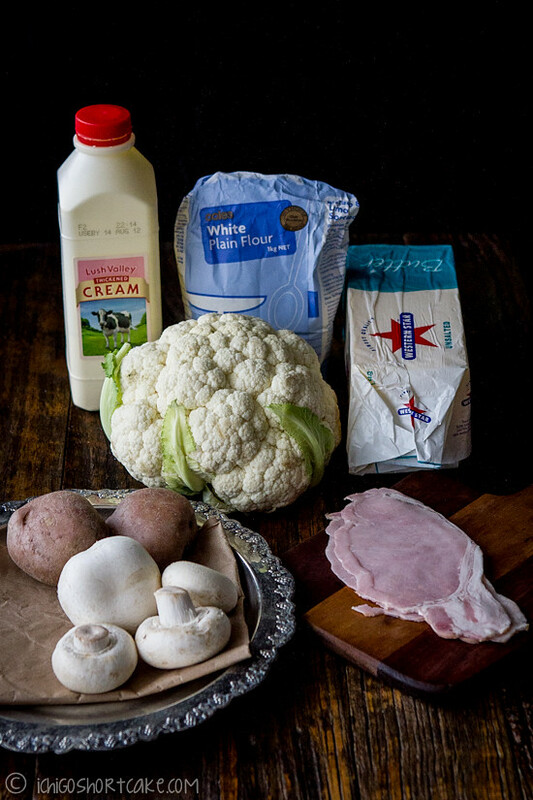 definitely bookmarking this for the next time i get cauliflower, sounds so super delicious! That cauliflower shot is superb. 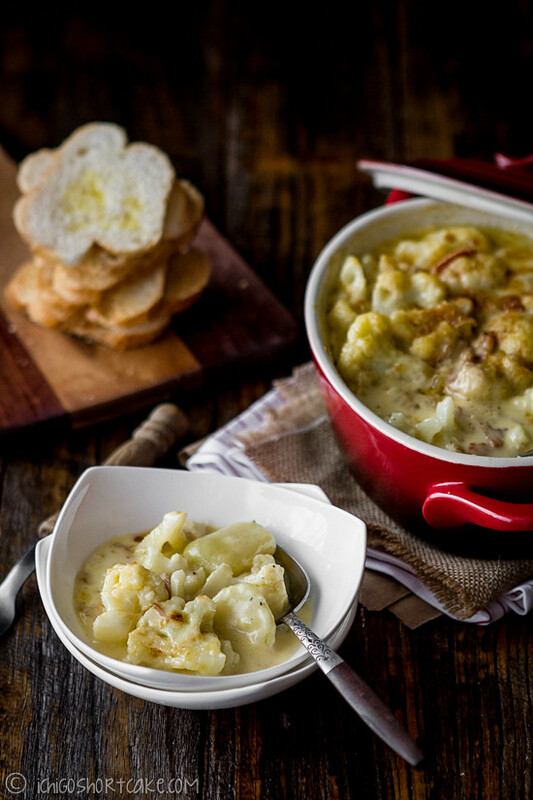 Love this dish – cauliflower has great flavor, and I love it combined with potatoes. Really very nice – thank you. Totally saving this recipe. LOVE cauliflower and potatoes so this is my kind of meal for sure. Your photography… outstanding Jenny!!!! Did I mention about the table/wood? I think I did, but I always love looking at those beautiful wood/rustic color. That’s a nice table/wood and I want that for my dining table… 🙂 Cool days are coming up soon, and this will make our body and heart warm.